This cute film from 1992 stars Whoopi Goldberg as Deloris Van Cartier, a Las Vegas singer. After being indirectly (or perhaps directly, depending on the way you look at it) threatened by her Italian boyfriend in the mob, she flees to the police for protection. However, the protection she was expecting was not the kind she received. She was placed into the nunnery as Sister Mary Clarence alongside strict Mother Superior, played by Maggie Smith. From here, we see interesting confrontations and discussions among the two, as well as delightful performances by “sisters” of the nunnery. 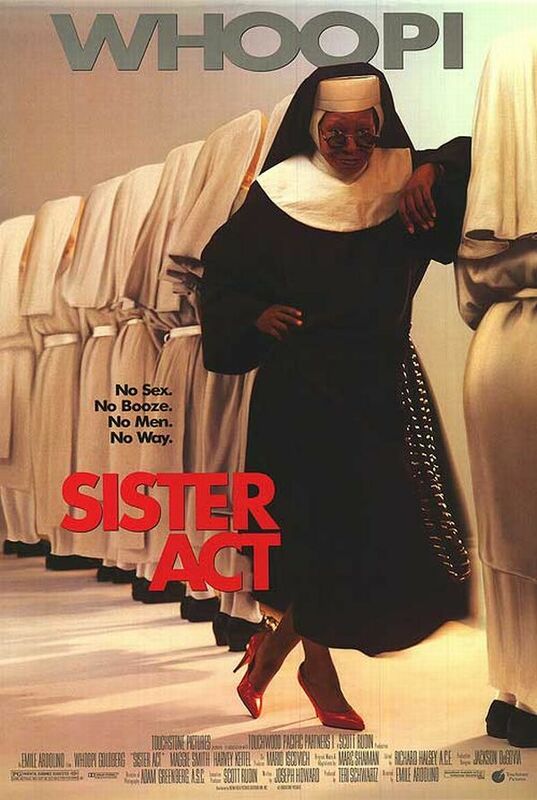 Sister Act is directed by Emile Ardolino, who also directed 1987’s Dirty Dancing (parental guidance required, folks) and 1990’s 3 Men and a Little Lady. The two nuns who stand out the most are Sister Mary Patrick played by Kathy Najimy and Sister Mary Robert played by Wendy Makkena. Najimy has had a few other Disney collaborations including 1993’s Hocus Pocus, as well as lending her voice to the character of Mary in 2008’s heartwarming Disney/Pixar film WALL-E. Makkena has appeared in many TV shows, including the pilot episode of Chuck, an incredibly awesome show on NBC which lasted five seasons. A shoutout must be given to the incredible Harvey Keitel who brought out his mafia skills as Vince LaRocca, Van Cartier’s boyfriend. Keitel was in the Nicolas Cage film National Treasure, but I remember him most from the ABC show Life on Mars, a US version of the UK series which sadly only lasted one season. However, Keitel is normally best known for hard hitting performances. The music is one of my favorite things about this film. You hear some great classics such as “Rescue Me”, “(Love Is Like A) Heat Wave”, “I Will Follow Him (Chariot)”, and “Shout.” The nuns perform a fabulous routine of these songs, transforming them into religiously based versions. For instance, “I Will Follow Him” represents following God. The way they patterned these songs into their own was truly delightful. My favorite performance was Makkena’s portrayal of Sister Mary Robert. I felt that her character brought the most depth to the screen throughout the duration of the film. I think this may have been the first time I saw this film in its entirety. I recall the last half hour, but did not remember anything previous to this. This was probably just as well, since I would not have understood the concept of the film at the age I was when Sister Act was released. This is an enjoyable storyline, but the script feels as though there is much to be desired. The plot lines are well understood and I’m glad to have seen it, but for some reason, this just feels a bit empty to me. It has its fun moments but it is surely not a favorite. Still a fun watch though. This is a sin, it’s a wicked indulgence. Didn’t they have any butter pecan? I have checking out your blog and have been following you on facebook too. I love the idea of watch every Disney Movie/Short. Its brilliant, as I have wanted to create a huge database of Disney Home Video, all the way back to betamax. Seems impossible. My question/comment is really to understand why you are including Touchstone films as Disney. While, Touchstone was a subsidiary of Disney, it does not represent Walt's vision and never will. Touchstone includes too many movies that are very non-Disney. Disney people don't consider True movie people would never put Touchstone and Disney as the same. Does that mean Hollywood Pictures too are part of Disney? Then that makes anything prior to 2010 on Miramax part of Disney. Its just doesn't seem right. Its my opinion, your blog is yours. Just seems like you are not being true to your goal by adding this "Non" Disney films to your list of movies. This list does include Touchstone, Miramax, and Hollywood Films. It also includes a few DreamWorks productions that have been integrated into Touchstone. And Studio Ghibli. But that's specific to the podcast. Which was a collaborated idea from the blog itself. The original blog was Ryan's and he might look at that list differently for that purpose.